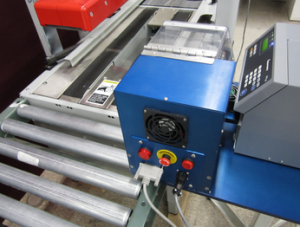 The E-Shot printer applicator prints and tamp applies labels onto products or cartons at a rate up to 30 per minute. The E-Shot is designed for production ﬂoors with tight spaces. Designed to work with automated case sealers, it is capable of repeated accurate application of pressure sensitive labels to the carton side. It is an ideal choice for repeated and accurate tamp-on labeling. The E-Shot printer applicator is a simple, elegant design, utilizing oﬀ the shelf components and no proprietary programming. It is built for reliability and is engineered for easy service and maintenance. The low cost of the E-Shot ensures a rapid return on investment. - No worries about carpal tunnel or other repetitive stress injuries to contend with. - Faster application due to the E-Shot’s ability to print, peel and apply the label autonomously. - More efficient & consistent labeling. - Place the label in the same spot on your package every time. - Precision means that you only need to apply the label ONE TIME! No need to peel and re-apply the label due to poor placement. - No need to connect the E-SHOT and air source, just plug it in to any outlet and you are ready to go. - Cleaner, safer, more responsive to your labeling needs. - No oil, dirt or air pressure to contend with. - An adjustable super-responsive soft touch applicator mechanism that is safe and 100% effective to your application needs. - Send it your information, trigger the apply and watch your production levels increase. Adjustable rotary arm Adjustable delay Banner Photo cell application trigger Positive Vacuum application head assembly Adjustable Retract and Extend sensors Adjustable positive stop home position. 17” W x 27” L x 17” T 35 #’s ( without printer ) Electrical: 110-120 VAC , 50/60 Hz NO AIR REQUIRED!